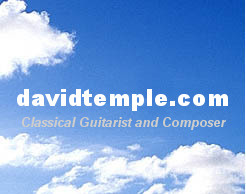 Concerts: Chamber Music Societies, churches with a music series, performing arts centers and other arts organizations have hired David not only as a part of their regular concert series, but often as a special event or as a fund-raiser. Please tell us your interests and needs, and let's correspond to create a performance that will benefit you and your organization! Other private events: The emotion and intimacy of the classical guitar can also be the right choice for an anniversary, a memorial, even a special cocktail party, or any other special event where live music would truly "make the difference." We can find the music that works for you.